How to fix WINDOWS 7 NOT GENUINE problem? Are you having a non-genuine version of windows-7? Is your os irritating you by repeatedly showing “This copy of windows is not genuine.” ? or if some of the features like wallpapers and screen savers are not working because of it. If you have an answer ‘yes’ for any of the above problems then you are at right place. Follow these simple steps to get rid of such problems with ease. 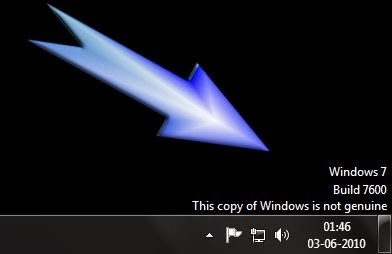 Note: You need not buy a new copy of windows. First of all turn off the auto update of windows. So that your pc will not get connected to Microsoft ‘s official site automatically. By doing so they (microsoft) can not track whether the copy of windows you are having is genuine or not. Then run command prompt as administrator or simply hit windows+r and then write ‘cmd’ within it and hit enter. Right click on command prompt and select ‘run as administrator’. Now type the below code within the command prompt window that has appeared. And then hit enter and your work is done. Your computer will not show that type of message repeatedly and those features like wallpapers etc will also work . I hope you have enjoyed the post. If you are facing any difficulties then feel free to ask through comments. Yes, you are right. But in case someone has to re-install windows then this would be a helpful way for him/her instead of buying a new copy of win os, as the pirated versions don't show that much problem if installed correctly.